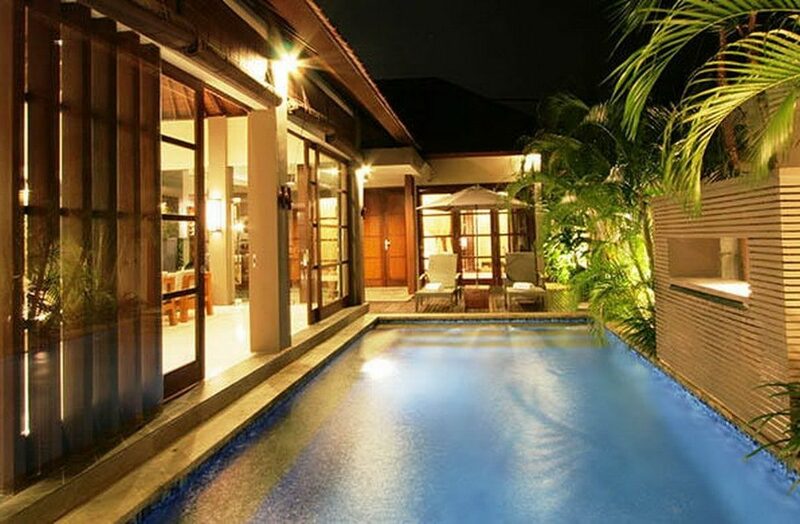 This stylish 2 bedroom Seminyak villa, set in the serene confines of a luxurious tropical complex in the sought after district of Petitenget in Seminyak offers guests all the trappings of a high end hotel with the benefit of their own completely private accommodation. 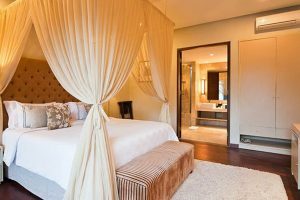 Hospitality is taken very seriously here and each villa has its own dedicated butler and is serviced by daily housekeeping. A villa manager is also on hand to answer any questions you may have or help to arrange any excursions you wish to take. 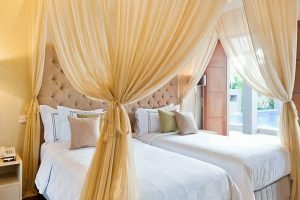 Enveloped within secluded walls, the villa has separate living and sleeping pavilions arranged around the glittering waters of your own private pool and tropical garden. This also provides an alfresco dining spot on the wooden decking, just the place to tuck into the delicious complimentary breakfast. The extensive living accommodation blends together the very best of contemporary architecture with the traditional, open to the elements, Balinese style. Under the high wooden vaulted ceiling this integrated space features a fitted kitchen with modern appliances and gleaming granite work surfaces, a chic wooden table with high backed rattan chairs and a comfortable modular sofa. This is a great space to take advantage of the in-house dining option and employ one of the fantastic chefs to come and cook for you. 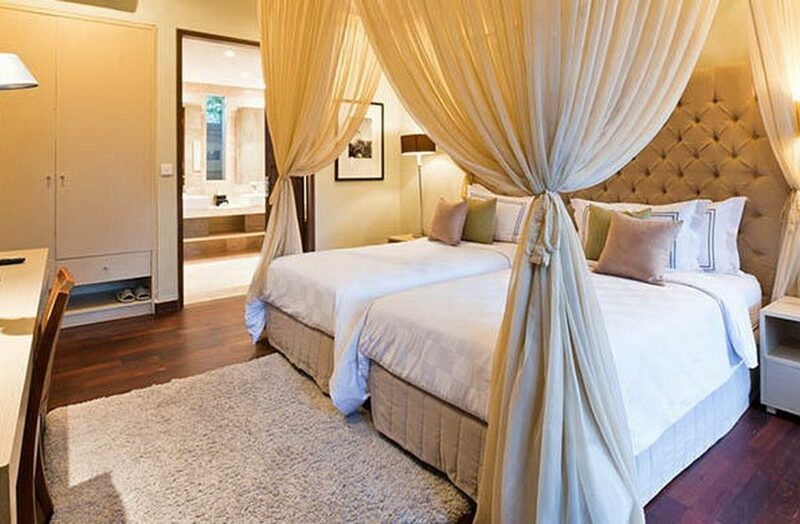 Elegantly decorated with the use of natural materials and a relaxing organic palette this is just a divine space to spend time with your loved ones. 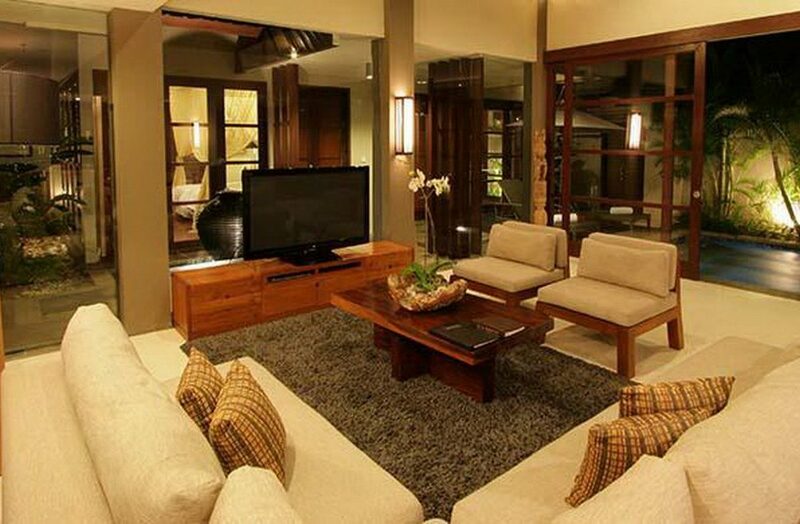 This area is equipped with Satellite TV and DVD players as well as having Wi-Fi throughout. 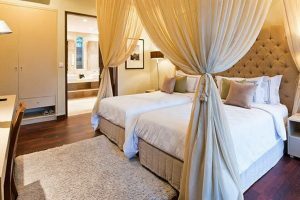 The master suite is decked out with a king size canopy bed and large fitted wardrobes to safely stow away your holiday purchases. The en suite has a double vanity unit, a deep bath tub and a separate shower. 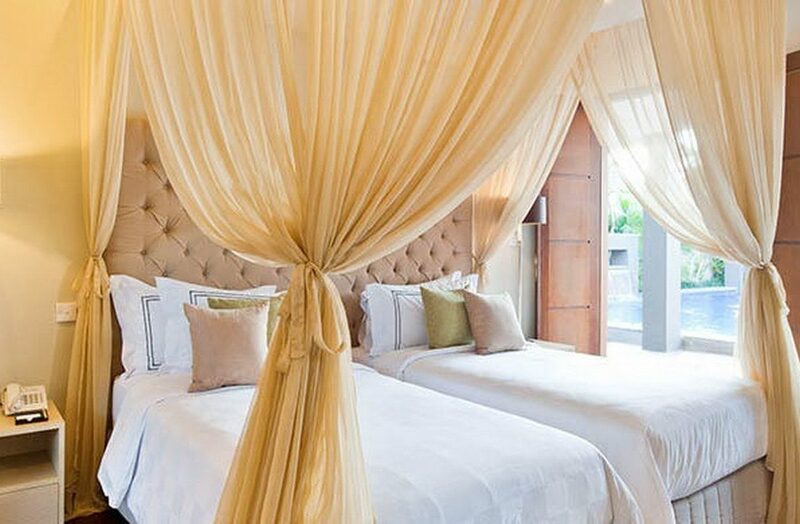 The second bedroom has two queen-size beds swathed in canopy drapes and has its own superbly chic en suite. All the bedrooms are air-conditioned, equipped with King Koil mattresses and high quality linens and have Satellite TV and DVD players. Situated in the vibrant area of Petitenget, this villa provides easy access to the beach and a variety of restaurants with excellent quality cuisine within walking distance. 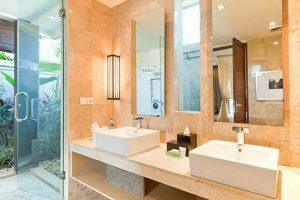 This is also a great jumping off point to explore the surfing beaches of Canggu or delve deeper into the Aladdin’s cave of shopping that lies at the heart of the district. 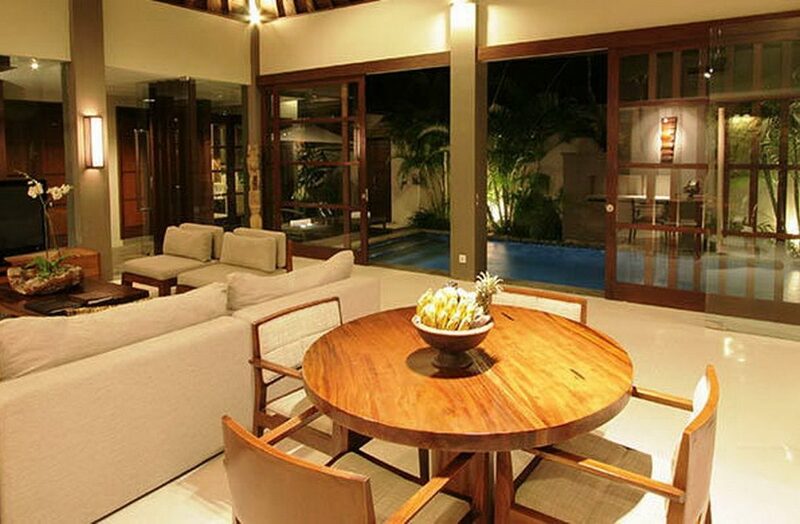 This stylish 3 bedroom villa is ideally located in a quiet cul-de-sac in Seminyak and provides guests with a wonderfully tranquil, tropical hideaway where your every whim is taken care of. 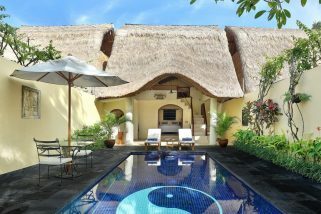 This charming villa which seamlessly blends authentic Indonesian architecture with a contemporary finish is ideally situated in the vibrant resort area of Seminyak very near the fashionista’s paradise of Oberoi. 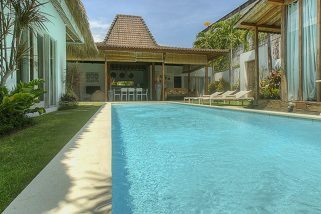 Villa Impiana 1 is a spectacular 1 bedroom Seminyak holiday villa rental nestled in a private compound off Jalan Kunti road.